Preschoolers and kindergartners love to learn, especially when it is a fun experience. 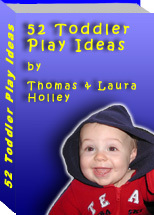 If you are a creative parent, making learning fun for your toddler or preschooler will be a snap. If you are not so creative, we have a few simple ideas to get you going. Whenever you play a game with your children, make sure they understand the rules and can demonstrate for you what it is you want them to do. During and after the game, acknowledge your children's ability to use self-discipline and positive social skills. Try saying phrases such as, "Good Job! You stayed calm even when you lost a turn. I liked the way you took that deep breath and kept on playing. Give me five!" Build your children's cooperation and listening skills using a weekly story poster. Create a four-square design on a piece of paper, and write down what your children learned first, second, third and fourth that day with regard to the toilet. You can use an instant camera or draw pictures with your children to document progress. Encourage cooperation and listening skills throughout the day by clapping, singing songs or reading their potty picture books with them. Try saying things such as, "Wow! You said 'potty!' Good job. You listened (Mom pulls her ears) and you said 'p-o-t-t-y' (Mom says word slowly) just like Mommy!" After success, show them what they've accomplished. You can show them any pictures you took, and you might say, "We are putting away your new training pants! You are a big boy now!" You might even want to add the picture book to their baby book as a memento of their learning experience. How often do you hear your child say, "Nothing!" when you ask what he or she learned in school that day? To get a better picture of how the school day went, ask your child to draw you a picture on the way home of what he or she liked the best and least about school that day. You can start by saying something such as, "Now that we've stopped at the red light, show me what you've drawn so far. (Mom looks in the review mirror) "That drawing is wonderful!" By the time you get home, your child should be ready to share all the details! There's a new kind of fun and calm out there in the name of the Dreaded Wheel of Consequences, invented by Julie Butler and her family in central British Columbia. In an interesting twist on charts and discipline, this versatile wheel can be hung on a wall or toted with you in the car and on vacations. It's a way to get whole family involvement, and a little bit of humor to get us over the discipline bumps. Kayla Fay, publisher of Who Put the Ketchup in the Medicine Cabinet? says, "This is the proverbial spoonful of sugar to help the medicine go down! Only a loving parent could come up with such an effective way to discipline children." Originally, the wheel sprang from constant battles between Julie's 9- and 12-year-old children, David and Laura. With battles raging in their home, Julie and her husband decided they must find some way to keep the peace. Julie says, "We hated the atmosphere of tension that would invariably follow these exchanges. Our once happy home was being turned into a war zone, and it felt like there were land mines scattered beneath our feet. One night, in desperation, we called the kids into the living room and told them how upsetting their behavior was. We asked them for suggestions on how we could restore peace and serenity back into the family." These suggestions were arranged around the perimeter of a board, and a spinner attached to the middle. The premise was that the spinner would choose the consequence for them, and they would hang the board in plain view in the kitchen. Julie remembers, "We crossed our fingers, and waited. And waited. It was amazing. Just the presence of the board, hanging on our kitchen wall, had an instant calming effect on the atmosphere in our home. Occasionally we'd see one of the kids standing in front of the board, idly flicking the spinner, checking it out. But the fighting had stopped." Of course, the battle was won, but not the war. Ten days later, the fighting began again, but this time they were prepared. Says Julie, "We called them both into the kitchen, took the board down off the wall, and placed it on the table. They knew what they had to do. How could they refuse? They chose the consequences. They practically invented the board. It landed on the most dreaded consequence of all: Hug and make up!" Once the fighting subsided, Julie realized there were other behaviors she also wished to curb. "It seemed like the kids were always leaving the lights on when they left a room. Or they'd leave the TV on when they went to bed. Why not make another wheel with consequences related to wasting electricity?" Forty-eight consequences and 16 rewards are printed on peel-and-stick paper with colorful eye-catching graphics, enabling parents to customize the wheel to meet their family's needs. Just cut them out and stick them on. It's very easy to make up your own consequences and themes. Interestingly, Julie says the wheel lowers her stress, keeps the consequences appropriate, and removes parents from the "Bad Guy" label. In the past, she and her husband would have to repeatedly ask David to do something, only to hear him say, "I know." This would come to a boil, and in anger they would yell and exact a punishment too harsh for the infraction. Now, the wheel does all the work. "David, it's 8:15; you haven't started the dishes yet. I'm afraid we'll have to spin the wheel." "I'm sorry, Dear. It's really not up to me. Those are the rules we all agreed on. Gee, I hope you don't land on a really bad consequence." Julie says, "The amazing thing is, we're no longer the bad guys. We can actually root for the kids as they drag themselves up to the wheel. It's no longer 'us against them'. It's the wheel that they have to answer to. But the greatest thing of all is that we hardly ever have to use the wheel. It hangs on the kitchen wall, acting as a watchdog and reminder." The Butlers' website, www.consequences.ca shows some parents of ADHD children have found the wheel to be a wonderful program. That is great news for many! Every parent should work with their child's personality and decide if the wheel is right for them, keeping in mind that every program doesn't work with every child. There are a couple of letters on Julie's site from parents asking for help with children who are completely out of control. One mother says her five-year-old "beats (his big sister), kills animals, curses, and destroys everything in his path." Another mother said her six-year-old adopted daughter has angry outbursts and goes in cycles. She wondered what to do when her child refuses the consequences and it starts another battle. These are warning signs of something more serious than just a discipline problem. Often, young children and teenagers exhibiting these symptoms have a physical problem that can cause behavioral changes, such as infections, Lyme Disease and thyroid problems. Mental disorders such as early-onset bipolar disorder can also cause very similar symptoms and must be diagnosed and treated immediately. In these cases, the Dreaded Wheel of Consequences would not be appropriate and medical intervention is needed immediately. For help, contact your pediatrician and look for information on these diseases and disorders on the Internet. However, there is still a possibility that the wheel will be valuable with a child who is stabilized. Again, parents will have to make the decision to try the wheel according to each child. Parents of children with normal behavior and discipline problems are encouraged to try this wheel and have a little fun with discipline! Bringing the whole family into the discipline decision-making is an excellent way to work as a team and come to a peaceful solution. The wheel isn't meant to exact negative punishment on a child, but rather remind them to pick their battles and mind their parents. Teachers and parents alike will find the wheel very useful in classrooms and homes everywhere with children ages four and up! You can find out more about the WHEEL here. Gina Ritter is a personal life coach for parents and publisher of the Busy Family Network of sites at www.busyfamilynetwork.com. She lives in New York with her husband and three boys (who also spin in the kitchen).